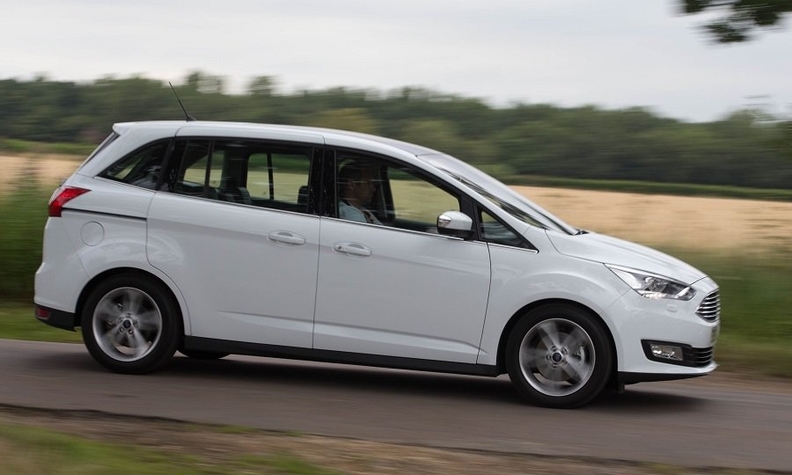 Last month Ford announced it will ax the C-Max and Grand C-Max (shown) compact minivan in June, reducing shifts at its plant in Saarlouis, Germany, to two from three. Ford's Cologne factory also lost its third shift in 2017. Ford Motor’s restructuring of its European operations and its shift toward utilities has one significant effect: Germany’s importance to the automaker in the region is gradually being diminished. Germany currently is critical to Ford of Europe. Half of the company’s 53,000 European employees work there, and last year just over half its passenger cars sold in Europe were built in either its Cologne or Saarlouis plants. Cologne has also been home to Ford of Europe’s headquarters since 1999 and is the center of Ford’s small-car development globally. Cologne also has an engine plant. But Ford of Europe’s center of gravity is shifting. In March, Ford announced it will ax the C-Max compact minivan in June, reducing Saarlouis’s shifts to two from three and leaving just the Focus compact at the plant. Cologne also lost its third shift when it started building the newest Fiesta in 2017. Ford said this year that it would cut 5,000 jobs in Germany. The Fiesta is Ford’s best-selling model in Europe and the Focus No. 2, but that could change. Demand is falling in these traditional sectors as utilites become more popular, and Ford has said repeatedly that it’s happy to sacrifice sales of cheaper, unprofitable versions of these models to concentrate on higher-margin variants such as the Fiesta and Focus Active crossovers. It’s already happening: In the first two months of the year, European sales of the Fiesta fell 24 percent to 34,523, according to market researchers JATO Dynamics. Sales of the newer Focus were up 12 percent to 36,601 but are expected to fall again. Meanwhile, Ford has announced a second small utility that’s likely to further steal sales from Fiesta: the Puma. This Fiesta-based vehicles won’t be built in Germany but instead in Craiova, Romania, where Ford has gradually been building up capacity. The Puma will be built alongside the EcoSport subcompact crossover. To accommodate the new car when it starts production this year, Ford will add a third shift at Craiova, Ford of Europe President Stuart Rowley told Automotive News Europe this month. That addition will take capacity at the plant to 100 percent, Rowley said. “We’re going to fundamentally redesign Ford of Europe, and we need to be choiceful about where we invest,” he said. Ford hasn’t communicated Craiova’s capacity, but local media reports say it could be as much as 300,000 annually with the third shift. Craiova also has an engine plant where it builds the 1.0-liter, three-cylinder EcoBoost engine. Total employment at Craiova will rise to 5,900, Ford said last year. Romania joins Turkey as a critical low-cost manufacturing hub for Ford in Europe. The two plants in Kocaeli, Turkey, build the bulk of Ford’s highly profitable Transit van range and are expected to receive more work in the future when Ford starts building a large van for Volkswagen Group, expected in 2023. Ford already sources about half of its parts for Transits built there and looks to raise that, said Steve Armstrong, Ford of Europe’s chairman. One possibility is to relocate diesel engines, currently built in Ford’s Dagenham, England, plant. Ford’s other important manufacturing base is Valencia, Spain, where it will build the newest Kuga, scheduled for launch this year. The Kuga secures the future of the plant, which is set to lose the Transit Connect van when VW begins building its replacement early next decade. Valencia also could lose the Mondeo midsize car and S-Max and Galaxy minivans if Ford decides to end them in response to falling sales. Germany is likely to remain Ford’s development hub and headquarters, but it makes little sense for a company trying to overcome persistent losses to build small, low-margin cars in such a high-cost country, no matter how efficient the plants.